Nominations for the List will continue to be accepted by the York Open Planning Forum, strictly on the understanding that they are provisional until the draft List is formally adopted by the Council and that they will have to be assessed against a set of Criteria yet to be agreed. Download a Nomination Form in pdf format - you will need Adobe Acrobat Reader (free download). It is important this form is used to put forward a building, structure or place because it asks for the information needed to include an item on the List - about why the building or structure or place is important, where it is, how old it is, and so on. A contact for the person putting the suggestion forward is requested because sometimes it is necessary to check on details of the information. What sort of buildings may qualify? Dated 1913 and a valued and useful amenity in the Gardens for very many years. It contributes to the character of the Gardens. Dating from 1889. Important for providing educational and recreational facilities to railway workers since its inception. Also very important to the character of the area where it is part of the group of original railway buildings around the present railway station, listed grade II*. Put forward by a large number of people across the City as part of the York Press's help with the project. It is another valued community facility, and was given to the City by Rowntrees in 1908/09. "In memory of Henry Richardson of Cherry Hill, York, 1813-1895." He was proprietor of a tannery on Cherry Hill beside Skeldergate Bridge and a co-founder of the York branch of the RSPCA in 1864. 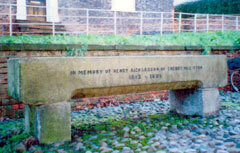 It is a memorial to a respected pillar of the local community. You can also download and view the draft policies and criteria document (.rtf file). To search for nationally listed buildings near you, and to find out more about the national register of listed buildings, visit the Heritage Gateway website.